Wondering how to use watercolor pencils? 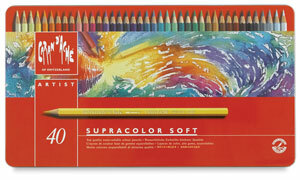 The water soluble colored pencils can be used in any way you use watercolors containing unlimited possibilities. And you will have more control over your art than by using traditional brush-applied watercolors. How To Use Watercolor Pencils? Glaze Them! You can glaze the colors one by one layer with water added in between. For example,start with a color with your watercolor pencil, then add some water. When dry or semi dried, then add another layer of color and water. In traditional watercolors, You apply wet pigment to either a wet or dry surface, known as wet-into-wet and wet-into-dry techniques. Watercolor pencils can do the same thing – simply break the points off these water-soluble pencils and soak them in the wells of a palette. Then add a few drops of water and let the points dissolve in the water for about half an hour. Watch them magically transform! They'll have a consistency much like traditional watercolors from a tube. You can pick up a watercolor brush and apply this dissolved pigment to a surface. How To Use Water Color Pencils? Wet Them! Take the color directly from the pencils with a wet brush and then apply the pigment to wet or dry paper surface. How simple is that? Don’t' have brushes? Apply the color directly to a wet or dry surface with a wet or dry pencil point. How To Use Water Color Pencils? Spray them! You can spray with a small atomizer, getting a modified layer look and intensifying the color at the same time. Lay the artwork flat and standing at least four or five feet away, spray in intervals of small amounts at a time, allowing drying time between applications. How To Use Water Color Pencils? Grind them! You can grind the watercolor pencil cores into a powder and sprinkle it onto wet paper. The powder can be moved around the paper with a wet or dry brush, or tipped in different directions to spread across the surface. You will have unlimited combinations of techniques like layering, burnishing and under-painting with water soluble colored pencils. After you have learned how to use watercolor pencils, click here to learn more about colored pencils.